There’s a lot new in marketing tech out there this week, and if you missed it, you can catch up on it right here. We’ve rounded up all of the important news stories that you’ll need to know in order to stay current. Cloud computing continues to move forward. Here are the important articles of the week. Enterprises are buying for convenience. Amazon has dominated the public cloud world, and despite their attempts, other companies have been unable to have much of an effect on the king of the public cloud world. iCloud has been something that Apple customers have complained about for a long time. Apple has listened to these complaints and used customer’s insights to improve iCloud with their new Mac OS X. Consumer Physics has a handheld molecular food scanner called SCiO, which will tell you the chemical makeup of what you eat. They’ve recently topped $2 million in crowdfunding via a Kickstarter campaign. The evolution of the web has been fun to watch, and this week is no different. Here’s what you need to know. 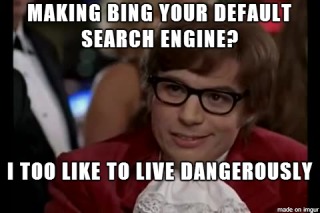 Instead of having Google as default search option, Apple has decided that it is a better option to go for Bing as the default search engine for their newest operating systems. The LinkedIn facelift means the networking site will look a little more like Facebook. LinkedIn also hopes to draw in more people to their paid, premium tiers. Finding and hiring software engineers can be a difficult thing to do, so Gild is making that easier. Gild has recently closed on $13.5 million dollars. Apple has made some changes to inter-device sharing protocols. They’re doing this to make devices work together better while providing a way for end users to not have to deal with transit technologies. Mobile computing has never been bigger, and it continues to evolve and grow. Here is what’s happening this week. Apple announced an update to iTunes Connect at its Worldwide Developer Conference. The update comprises a fresh new look and a new analytics dashboard. The New York Times has launched their new app NYT Opinion, which gives users access to more Op-Ed content. The content will be from the New York Times and aggregated from elsewhere. The subscription is $6 for a four-week subscription.